A prince once became mad and thought that he was a turkey. He felt compelled to sit naked under the table, pecking at bones and pieces of bread, like a turkey. All the royal physicians gave up hope of curing him of this madness. The king grieved tremendously. “I am a turkey,” said the prince. “I’m also a turkey,” answered the sage. They sat together like this for some time, until they became good friends. One day, the sage signaled the king’s servants to throw him shirts. He said to the prince, “What makes you think that a turkey can’t wear a shirt? You can wear a shirt and still be a turkey.” With that, the two of them put on shirts. The sage continued in this manner until they were both completely dressed. Then he signaled for regular food, from the table. 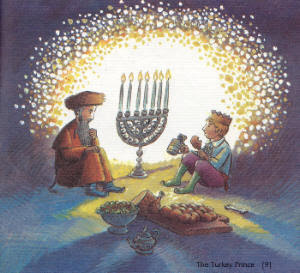 The sage then asked the prince, “What makes you think that you will stop being a turkey if you eat good food? You can eat whatever you want and still be a turkey!” They both ate the food. Finally, the sage said, “What makes you think a turkey must sit under the table? Even a turkey can sit at the table.” The sage continued in this manner until the prince was completely cured. Some days later the wise man once again signaled the king. Broiled beef, baked potatoes, and fresh green vegetables were brought and placed on the ground near the sage. Looking quite pleased with himself, the wise man bit into his food and exclaimed, “Absolutely delicious! It’s good to be a turkey sophisticated enough to enjoy the food of men.” The prince readily agreed and hungrily ate his fill. The king’s son came and sat by the table. It was only a matter of time until he was cured. Who is the King? The King is the ultimate King, HaShem. Who is the Prince? it is all disaffected Jews in the world. Those who feel separated from the community and unworthy because they are unlearned in Torah, Talmud, laws and customs. What does the table represent? This is the key to the story. In the Baal Shem Tov’s time, the law was seen as the all of Judaism. The Rabbis spent most of their time studying the law; almost to the exclusion of the Torah. The study of Talmud and the Shulchan Aruch was the basis of all Judaism, and if you could not spend all your free time studying them, you were an ignorant peasant unworthy of your heritage. Judaism was quickly becoming an elitist religion. The Shulchan Aruch is literally translated as “Set Table”, thus the Prince is beneath the law and almost crushed by it; he can only eat from the crumbs that fall from those who feast at the table. The Wise Man is the Baal Shem Tov himself. HaShem wants his people (the Prince) to be part of the Royal Court, but he/they are trapped beneath the law. Feeling no higher than the birds in the wild. Unworthy to stand before the King. HaShem summons a tzaddik to bring the people back; out from being trapped under the law. The Wise Man / The Baal Shem Tov goes to the people/prince and shows them that there is joy in serving HaShem in even the simplest matters. He then shows them how to serve HaShem by having joy in prayer and pouring out your heart. He shows them how to see the mitzvot as an opportunity to show HaShem their love and fear. And, finally, he shown them how to study the Torah in order to serve HaShem with every fiber of their being. At this point, the Prince is once again part of the Royal Court and seated AT the table/law instead of being under the law. This is the story of how Chassidus came to be. Well, at least that is my interpretation of the story. What is yours?